Murder Squad is the side project of Entombed's duo Uffe Cederlund and Peter Stjarnwind and Dismember's Rickard Cabeza and Matti Karki. Chris Reifert (Death, Abscess) also joined in for vocal and guitar contributions. Murder Squad formed with the idea of carrying on the sound generated by Autopsy lo those many years ago. With "Ravenous Murderous" they've accomplished their mission. What you ultimately get with Murder Squad's "Ravenous Murderous" is a band that sounds more like Entombed than Dismember which is kind of obvious as Entombed's pacing is more in line with the general Autopsy sound. Uffe Cederland's guitar playing takes care of that particular sound although some of the Entombed bombast is, in this case, thankfully missing. Death metal vocals are always a sore point for me. But I've got to admit I do like Matti Karki's voice on "Ravenous Murderous" than I do on any of the Dismember records. Karki's growl is more of a menacing beast on this disc than his strained rapid-fire bark on Dismember records. No matter how you look at it Karki's growl on this disc is perfectly suited for the mid-paced riffs. Despite the three-chainsaw rating I must provide a caveat which implies that Murder Squad is for death metal fans only. However, if you are a fan of side-projects from well-known bands then "Ravenous Murderous" will also most likely be right up your musical alley. 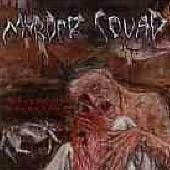 In addition to the disc being a good fit for fans of Autopsy it wouldn't be too hard to say that Murder Squad's "Ravenous Murderous" might appeal to fans of Bloodbath. "Ravenous Murderous" was produced by Murder Squad. The band makes a big point to state that the record was recorded in ‘a few days' which is logical given that this is a side-project and one must figure that the band was trying more to freshly capture the energized riffing that Autopsy was known for. Murder Squad: Matti Karki on vocals, Uffe Cederlund on guitar, Rickard Cabeza on bass, and Peter Stjarnwind on drums. Revised: 06 Jul 2018 02:07:07 -0400.